The Baron Son continues to change lives around the world with the latest releases in Polish, Portuguese, Russian, and Korean. Discover the business and wealth-building secrets of the world's most successful people. Best-selling Author As we close out 2008, it is important to evaluate the progress you have made toward your financial and business goals. If you or your small business are struggling to achieve and sustain this level of growth, you can leverage the BARON Wealth and Business Coaching Programs to take advantage of industry best-practices, turnkey solutions, and value-added resources to help you generate more freedom, income, and stability. Listen to this week's BARON Solution Minute to discover "Seven Ways to Quantum Leap Your Success in 2009." $297 Value - Yours FREE to Attend! Register for the FREE BARON Book Publishing and Marketing Teleseminar events on December 9th, 11th, 16th. Join international best-selling author William R. Patterson and expert writing coach N. Kali Mincy as they share their success secrets and answer your questions on writing, publishing and book marketing. William R. Patterson is winner of the 2008 and 2009 Web Awards for Best Author. His wins are the result of 650,000 votes cast from over 130 countries. His best-selling book, The Baron Son, has been translated around the world and selected for the Forbes Book Club. 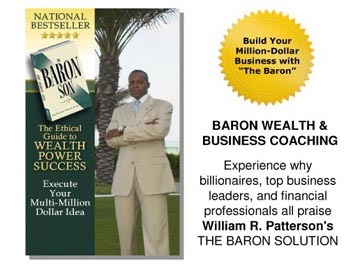 William has been a featured guest on over 1,000 television and radio programs and has created over 150 products and services based on The Baron Son. N. Kali Mincy is a writing coach, consultant and speaker whose client list includes business, education, literary, and marketing writers from Harvard, Yale, Columbia and Georgetown. She has developed nearly two dozen writing and editing workshops and coaching programs. "It was exactly what I expected it to be. William is a genius. He had me extremely motivated and put me on the right path. I am looking forward to building my brand using The Baron Solution strategies and taking over the market I serve!" Don't Know Whether to Buy or Sell? Let us reexamine the seven major reasons that people struggle financially to point out ways in which you can make rapid and significant improvements in your life in 2009. The Baron Son is now available from Editora SENAC. 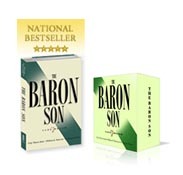 The Baron Son is now available from Companion Group. The Baron Son is now available from Smart Business Publishers. You are receiving this email from The Baron Series and Long & Silverman Publishing, Inc. because you have had an existing relationship with one of our companies, purchased a product/service or subscribed to one of our websites. To ensure that you continue to receive emails from The Baron Series, add subscriber@baronseries.com to your address book today.